On Tuesday, Valentino caused controversy with a show inspired by “wild, tribal Africa” that featured a cast of largely white models wearing bone necklaces and cornrow hairstyles, hitting the runway to the sound of bongos. “Please tell me that there are African Americans modeling in Valentino’s African line,” wrote one Twitter user, pointing out the questionable decision of choosing a line up of fair-skinned girls for a collection supposed to embody “modern day African grace” (only 8 of the show’s almost 90 looks were given to models of colour). With cultural appropriation being one of this year’s biggest talking points – thanks to the likes of Amandla Stenberg, the Dazed cover star and Hunger Games actress who went viral with a video entitled Don't Cash Crop My Cornrows, it seemed a risky move, even if done out of cluelessness rather than malice. Of course, Valentino are far from the first fashion house to get inspired by Africa. Notable examples include Yves Saint Laurent’s influential 1967 collection, Galliano’s SS97 haute couture for Dior, which was heavily influenced by Masai tribes, and Alexander McQueen’s AW00 Eshu collection, named after a god of the West African Yoruba people. 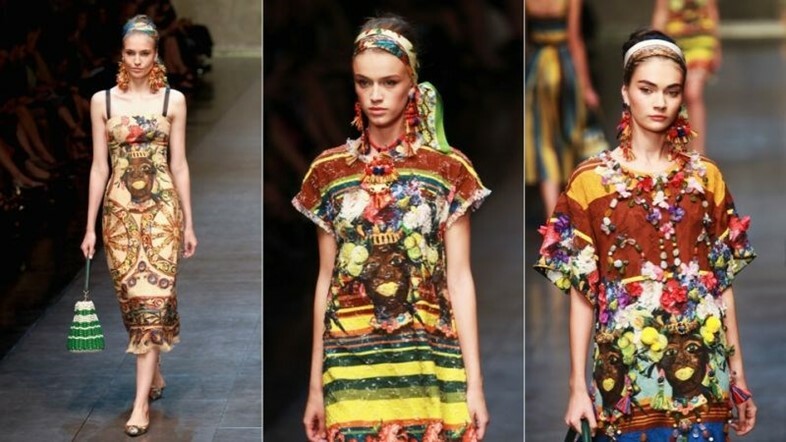 Recently, and much more controversially, Dolce & Gabbana SS13 was covered in blackamoor imagery – offensive, Mammy-like stereotypical depictions of African women that appeared on dresses and as earrings – in a show that did not feature a single black model in almost 100 looks. As for this season, Missoni cited Africa as a reference, and Junya Watanabe also clearly riffed on the continent, using colourful Boubou style fabric and ring-like necklaces. Many may question why fashion designers shouldn’t be allowed to borrow from other cultures, and the answer is that they can – but that doing so needs to be done with respect, appreciation, and an understanding of history. Vaguely pinning down a collection’s inspiration as “Africa” with words such as “tribal”, “primitive”, “wild” or “ethnic”, bongo drums and animal prints, completely reduces an entire continent (one that’s bigger than America, China, India and half of Europe put together, is home to over a billion people and has over 2000 languages spoken) into a few archaic and racist stereotypes. This language has been used for centuries; these are terms loaded with historical meaning. In the 18th century, in line with European colonial expansion, the word primitive took on the meaning of ‘uncivilised’. Language was a way to distance the colonisers from the ‘barbaric’ natives, a way to dehumanise them and thus justify their attempts to conquer and enslave them. For Europeans to borrow, pick ‘n’ mix style, from “tribal” Africa ignores the fact that, just a couple of hundred years ago, we were responsible for the destruction of those cultures, languages and people. The problem with appropriation is that it takes without giving, turns culturally significant items into decorations stripped of their meaning or heritage, and then sells them as luxury goods for eye-watering prices. It’s hard to imagine that, had an African designer put on the same show as Valentino and used African models, the collection would have been lauded as new, novel, or inspired. Furthermore, the use of catchall words like “ethnic” to mean “not white” or “not European” show just how overwhelmingly white-dominated the fashion industry is – it’s easier to fall back on a generic term than be specific and thorough in your research or understanding of a certain print or style of beading. While there are a fair few Japanese designers on the official Paris Fashion Week schedule, only one of 91 is black – Olivier Rousteing. That so few diverse models were chosen – even to model collections inspired by communities of colour – demonstrates that fashion’s problem with race and casting is pervasive and ongoing. Of course, some are keen to throw out or flat out ignore claims of appropriation, and skim over the fact that runways remain dominated by white models. Some fashion editors simply hashtagged #Africa, while The Telegraph responded to the topic by asking, “What about Saint Laurent’s cultural appropriation of Glasto-glamping?” – as if a French designer chucking wellies on the catwalk is comparable to reducing the 1.1bn population of the continent to the word “primitive”. Part of this is a generation gap – while they have years of experience, it seems fashion’s old guard may simply be out of touch. You would have to be, to not be left feeling (as Alexander Fury of The Independent was) “profoundly, profusely uneasy” by shows like Valentino’s, despite the clear quality of its craft. Will people flock to buy “tribal” print bags for thousands of pounds? Probably. But the modern world has spoken – it’s time fashion joined it in the 21st century.